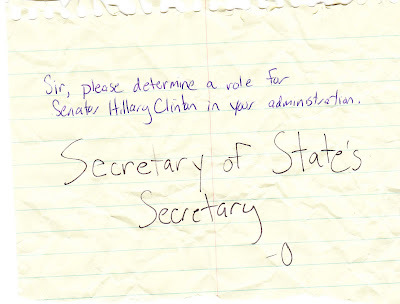 Our sources were able to dig the discarded piece of paper from the Presidential Elect Official Recycling Bin. The contents of the note are shown below. Really from the recycling bin?? ?I would expect the President Elect to pick Hilary for a very important role in his cabinet. If not Secretary of State then what??? So intriguing that Barack signs his notes with a simple "O." Are we sure we didn't elect Oprah's alter identity?